The Nintendo Bike Cop is an enigma wrapped in a mystery covered in confusion with a side of “huh!?”. If you search around online, you won’t find much about this product. When I was in third grade, I bought this from a shady mall that was notorious for selling no-box merchandise. I guess this one fell off the back of the Mario kart, because what you see is what I bought. At some point, I had the sound effects working, but unfortunately the unit is no longer functional. I recently cracked it open to find corroded batteries and dead roaches (that presumably died feeding on the batteries). So, the big question remains: Did it serve and protect? No. 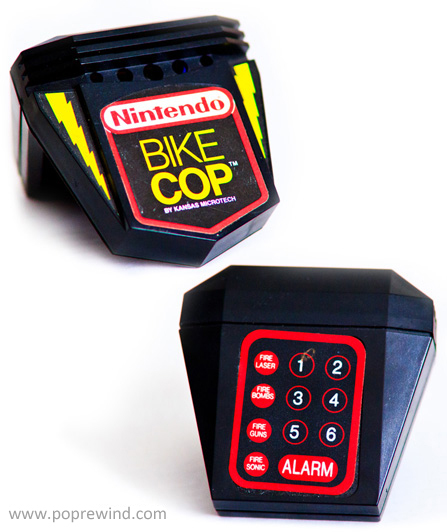 The Nintendo Bike Cop offered me no comfort or security in protecting my Huffy Dirt Dog bike. There is no clip to attach it to the bike, so it had to be tied on with a rope. Ultimately, I decided it was more of a security risk than it was worth and did not chain my bike at school sporting the Bike Cop. I always assumed this was to protect my bike, but I suppose you could ride around on a Big Wheel like Cartman and demand authority. Either way, this Bike Cop has honorably retired from the force. Whoa! I’ve never seen this before. What a wacky device. My friend had a Bike Max (similar to the Bike Cop). It brought him lots of ridicule.